I’m happy to announce that starting today, the New Workspace Experience has reached General Availability (GA). With the new workspace experience, Power BI workspace admins can use security groups to manage access to workspaces, enable BI teams to create workspaces without needing to create an Office 365 Group, and to provide granular workspace roles to make giving access to workspaces easier. We have started to roll out the change to make the new workspace experience the default workspace type when creating a workspace. We expect the roll out to reach commercial cloud customers within the next 7 days and sovereign clouds in the coming weeks. When you press the create workspace button in Power BI, the default workspace type is the new workspace experience. The new workspace experience does not create an Office 365 Group, meaning you will not see it in Teams, Outlook, or other places where Office 365 Groups appear. 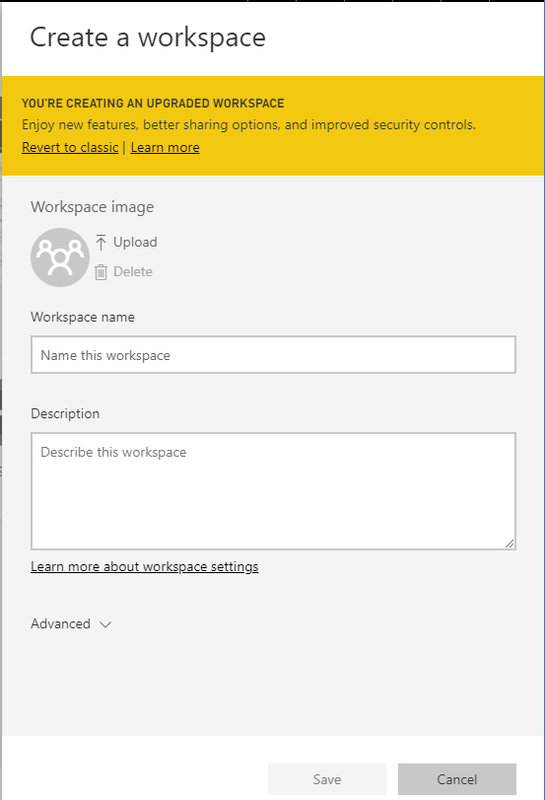 You can still create an Office 365 Group based workspace using the revert to classic feature available at the top of the create workspace pane. Below, you can see what the experience looks like. Why is this important? When you use the new workspace experience, you can use security groups, distribution lists, and even multiple Office 365 Groups to give users access to your workspace content. This flexibility allows you to manage access to workspaces using existing processes or automation. Since we support security groups, you can nest those groups to ensure the right users have access. The new contact list feature, available in workspace settings or under advanced when creating a workspace, allows you to specify which users receive notification about issues occurring in the workspace. By default, any user or group with the Admin role in the workspace is notified, but you can customize the list. Just be aware that users or groups listed in the contact list will be shown in UI experiences in the future to help users get help related to the workspace. This feature is especially useful if you want to track through a group alias issues occurring in various workspaces so you can work with the workspace Admins to address users’ needs in a timely manner. The Workspace OneDrive feature allows you to configure an Office 365 Group whose OneDrive file storage will be available to workspace users. The group needs to be created outside of Power BI. You can configure it by typing the Office 365 Group name, which will automatically pickup the OneDrive for the group. The location will appear under Files in the “…” menu on the workspace. Note that Power BI does not synchronize permissions of users / groups who are configured to have workspace access with the Office 365 Group membership. The best practice will be to ensure you manage workspace access through the same Office 365 Group whose OneDrive you configure in this setting. It will also appear in the Get Data > Files experience. Below you can see the Office 365 Group “Lukasz-Public-Group” is shown. In addition, the OneDrive – Business entry allows the current user to access their own OneDrive for Business. The Usage Metrics feature allows workspace admins to monitor usage of reports and dashboards. As part GA of the new workspace experience, we have started to enforce existing licensing rules that require a Power BI Pro license for users collaborating in workspaces or sharing content to others in the Power BI service. This was already enforced in the Service UI and for workspaces in the ‘shared capacity’. Now our Import REST API used for publishing from Power BI Desktop and by 3rd parties also enforces the license requirements for new workspace experience workspaces in a Premium capacity. We updated the error message shown in Power BI Desktop as shown below, to clearly indicate that licensing is the reason the user can’t publish. Previously, this error was more generic indicating the user has no access to publish to the workspace. At this time, we are not changing the licensing enforcement for classic workspaces based on Office 365 Groups. However, this will change after we give Power BI admins enough time and notice to be able to mitigate any impact on their users. Power BI admins can prepare for these changes by reviewing the Audit logs to see which users are publishing to a workspace and do not have a Pro license assigned, and then to assign them a Pro license, or these users’ access from the Premium workspace. As a Power BI Admin, there are two features within the Power BI Admin portal you should familiarize yourself with. The Tenant setting Create workspaces (new workspace experience ) setting controls who in your tenant can create workspaces. By default, it inherits the value from the Office 365 Portal for who can create Office 365 Groups. Since the new workspace experience is not tied to Office 365 Groups you should set a value in the Power BI admin portal. Once you do, the users you choose can create new workspace experience workspaces in Power BI even if they cannot create classic workspaces based on Office 365 Groups. The second Power BI admin capability to start using is the Workspaces list available in the Power BI Admin portal. Since the new workspace experience workspaces are not based on Office 365 groups, you’ll need to use this new UI to list, update, and manage these workspaces. There are also corresponding PowerShell Commandlets. Most importantly, sometimes a workspace can become orphaned – for example, the last workspace admin can leave your organization. This UI allows the Power BI admin to assign a new workspace Admin, or add/remove users from the workspace. To manage classic workspaces based on Office 365 Groups, you’ll continue to use the Office 365 Portal. When you click the “…” menu next to a workspace, you will see the options to modify the workspace, including to set Access and Recover the workspace. While with GA new workspaces are fully supported for all production uses, some capabilities will become available after GA. The forthcoming Viewer role for the new workspace experience, replaces the read-only workspace capability supported by classic workspaces based on Office 365 Groups. The Viewer role will allow users to browse and view content in a workspace, but not to edit it. One advantage is users with Viewer role are subject to Row-Level-Security (RLS) when viewing reports and dashboards directly in the workspace. It is too early to comment on a timeline for when this feature will be available. continue to use classic workspaces based on Office 365 Groups or publish a Power BI app to the users who need a read-only experience. use the new workspace experience and distribute the content through Power BI apps or sharing, both of which enforce RLS rules. Today, most workspaces are classic workspaces based on Office 365 Groups. These are not changed as part of the GA. Existing links to existing content continues to work without any changes. It also means we continue to list Office 365 Groups in the Power BI workspaces list to ensure continuity of experience. In the future, we will enable workspace admins and tenant admins to upgrade classic workspaces to the new workspace experience. You’ll be notified in the UI when the upgrade becomes available for your workspace. It is too early to comment on a timeline for when this feature will be available. As we have said previously, Content Packs will not be upgrade or preserved after workspace upgrade. Now is the time to move away from content packs and start to use Power BI apps. Soon, we will release capabilities that allow users to personalize app content by saving a copy of a report from within the app to their My workspace, and to discover and use datasets across workspaces. These capabilities will allow content consumers to personalize the official reports they can access to meet their unique needs, and will effectively replace content packs. After we have shipped support for the upgrade of all workspaces, we will initiate a process of required upgrade. We will communicate extensively before we initiate the required upgrade process. 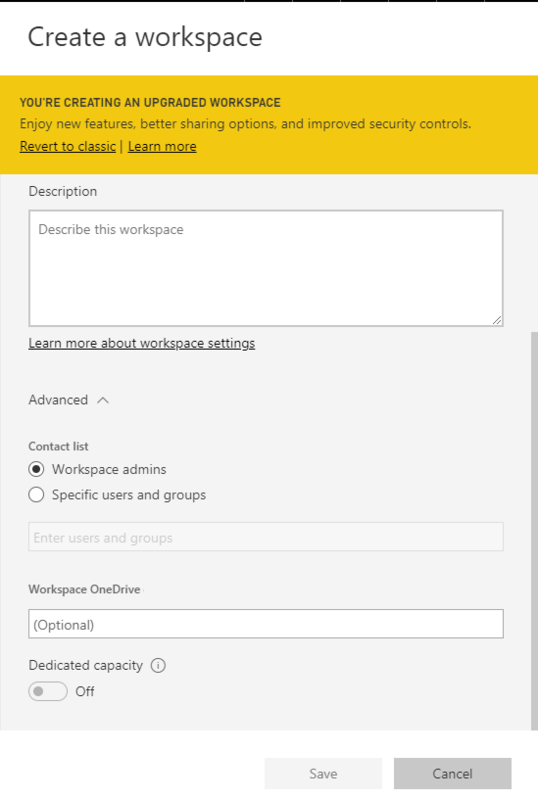 Can I still create an Office 365 Group based workspace in Power BI? Yes. At GA, when you create a workspace in Power BI the default is a new workspace experience workspace. However, you can opt-out by pressing revert to classic at the top of the Create Workspace pane. The ability to create Office 365 group-based workspaces is on the deprecation path and will be removed from Power BI. Can I still use an Office 365 Group to secure a workspace in Power BI? Yes. You can assign a workspace role to any user group available in Azure AD. This includes Office 365 Groups, security groups, email enabled security groups, and distribution lists. Are links to existing content affected by the new workspace experience GA? No. Links to existing items in classic workspaces aren’t affected by the new workspace experience. 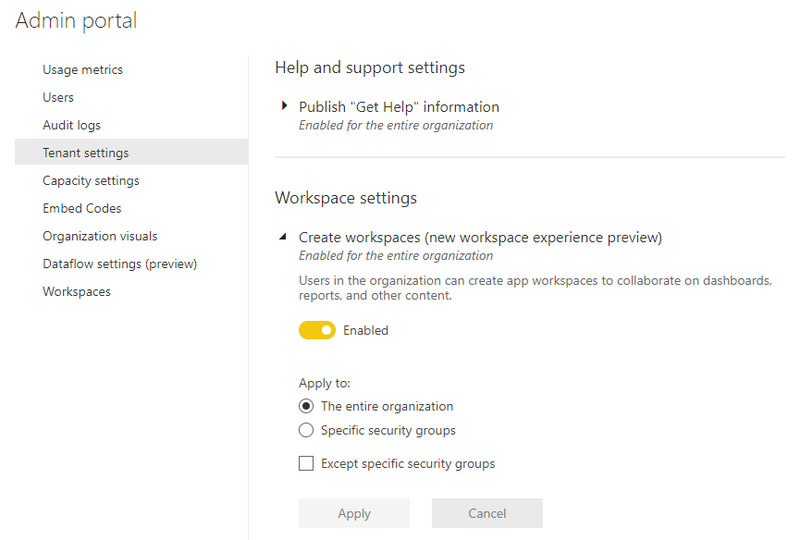 The general availability (GA) of the new workspace experience changes the default workspace you create, but doesn’t change existing workspaces. Are existing classic workspaces upgraded to the new workspace experience with GA? No. The new workspace experience GA only changes the default workspace type when you create a new workspace to the new workspace experience. Existing classic workspaces that are based on Office 365 Groups remain unchanged. Are workspaces still automatically created for Office 365 Groups? Yes. Since we support both types of workspaces side by side, we continue to list all Office 365 Groups the user has access to in the workspaces list.